John Derbyshire: Racial Gang Attacks—Why Won’t The MSM Tell Us The Numbers? This is one of those weeks where the inside pages of the newspapers (for those of you who remember newspapers) grab one's attention better than the big headlines. 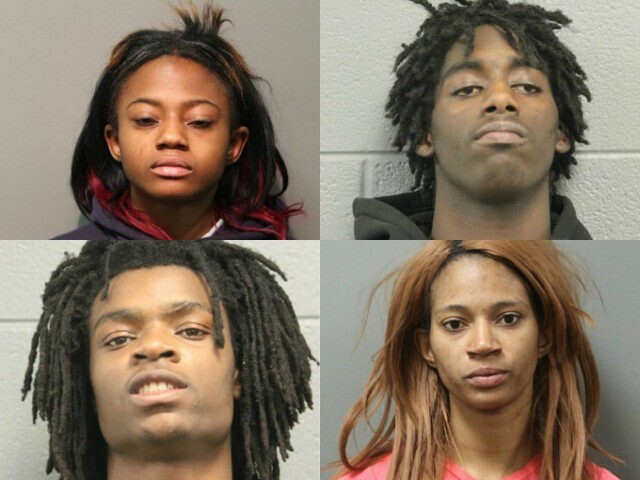 The story that the comment threads are talking about: the four young blacks in Chicago who kidnapped and tortured a retarded young white guy. The blacks are in custody; their mugshots have been broadcast to the media. You don't have to look very long at those pictures to know where we are here: on the left-hand side of the Bell Curve. Intelligence-wise, in fact, we're on the left-hand side of the black Bell Curve—IQs in the high seventies or low eighties. It's worth making the effort of imagination to see how the world seems to people like that. So how does it seem? Well, it looks the way the images and the Narrative promoted in our Main Strea m Media and the schools portray it. These blacks, aged 18, 18, 18, and 24, grew up on a steady diet of school textbooks, TV shows, and movies keeping alive the resentments about slavery and Jim Crow. Their teachers told them more about the underground railroad than about Thomas Edison; more about Harriet Tubman than about George Washington; more about Frederick Douglass than about Mark Twain. If they were given any poetry it was Maya Angelou, not Longfellow. Movie producers gave them The Butler, Twelve Years a Slave, The Birth of a Nation. All that picking at historical scabs left these dimwitted youngsters with the feeling that whatever happens to whites, they have it coming. Mix that in with the different behavioral profiles of blacks—low impulse control, high levels of psychopathology, the pack mentality—and you get events like this one. Indeed, you get much worse: anyone remember the Knoxville Horror? Do whites do cruel things to blacks? Yes, they do. One exceptionally cruel thing, the Charleston church murders of 2015, is still generating small news stories on page sixteen. The differences are in numbers and style. Numbers: Single-offender interracial crimes of violence break five black on nonblack to one the other way. Five out of six are black on nonblack. That at any rate was the case up to 2008—when the Department of Justice mysteriously stopped producing the relevant tables. Style: And that's single-offender style. I can't find numbers for gang attacks, but my impression from news stories is that this is very much a black thing. If interracial single-offender violence breaks five to one, I bet gang attacks are at least twice as disproportionate. Race differences in behavior account for much of this, of course. But those differences are amplified by the strange modern fashion, among nonblack educators and media creators, to nurture and inflame black hatred of whites — to keep black resentment alive. There is a corresponding effort to keep white people hating their own ancestors, their own country, and themselves — keeping white ethnomasochism alive. So there's nothing very surprising here. The main interest of this story in fact is that it goes against the cherished liberal Narrative of heartless whites being cruel to soulful blacks. Reporting on it therefore faced a headwind of fudging and equivocation from the Main Stream Media. It's been almost painful to watch the reluctance with which respectable outlets dribbled forth the racial facts of the Chicago case. Without that Facebook video of the torturing, they probably wouldn't have done so at all. Obviously, if you stop and think, hundreds of thousands if not millions of white individuals have suffered violence at the hands of mobs of multiple blacks over the last 50+ years, but that’s not a Thing in our national discourse. That’s just noise. Regrettable and forgettable. How many memorials to crime victims are there in this country? (I believe there is one in Orange County, CA and one in Long Island, NY.) Why do you even know such things? Are you racist? I'd like to see the actual statistics on gang attacks — in recent times, not in 1850-something. If the Washington Post were a real newspaper, instead of a preening mirror for insulated Goodwhite elites, it would have dug them up for us. I can recall some incidents of white gang violence against blacks — the Howard Beach vigilante attack back in the 1980s, for example [Michael Griffith dies fleeing a white mob in Howard Beach in 1986, NY Daily News Flashback, December 20, 2016]. But it really doesn't seem to be much of a thing in this century, certainly nothing like as much a thing as black gang attacks on lone whites. Probably that's just confirmation bias on my part, though. The truth of the matter could easily be shown by the numbers. So what are the numbers for gang attacks, black on nonblack versus nonblack on black? Didn't MSM journalists used to research and publish this kind of thing so that the American public was well-informed? John Derbyshire [email him] writes an incredible amount on all sorts of subjects for all kinds of outlets. (This no longer includes National Review, whose editors had some kind of tantrum and fired him. ) He is the author of We Are Doomed: Reclaiming Conservative Pessimism and several other books. He's had two books published by VDARE.com: FROM THE DISSIDENT RIGHT (also available in Kindle) and From the Dissident Right II: Essays 2013. His writings are archived at JohnDerbyshire.com.